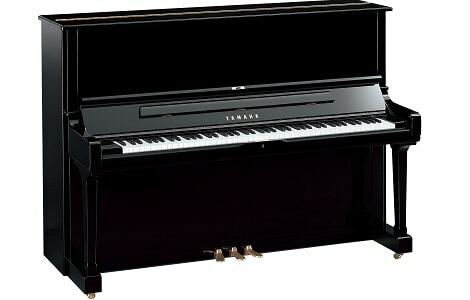 The flagship of Yamaha’s upright models, the SU7 represents the pinnacle of upright piano performance. Handcrafted using only the finest materials, this is a piano that delivers huge presence and rich, resonant tone with a rare degree of balance and precision. The SU7 features a unique keyboard, sporting the longest keysticks in Yamaha’s upright series. This not only provides optimum sensitive dynamic control but allows for the maximum possible variation in tonal shading and colour. The hammers used are to the same specification as the renowned CFX concert grand, and high-quality agraffes help to offer superior sound and clarity. The back grid features a six-post design, giving additional depth and focus to the tone, as well as contributing to overall stability. The lever-operated muffler allows for quieter practice, whilst the standard sostenuto pedal lets the player rehearse grand piano damping technique. A simple, classic cabinet in polished ebony, with concealed fall-hinges and exquisite polished mahogany interior finishing, completes the SU7’s impressive specification.